Approximately 30,000 medium sized employers (those with approx 62 – 149 workers), who staged in April-July, had reached their deadline to complete their declaration of compliance by the start of December 2014. 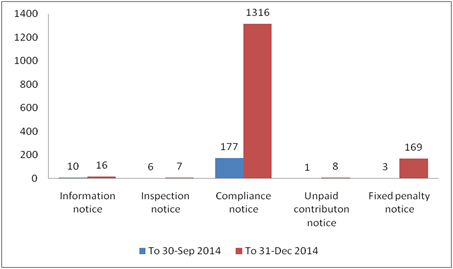 In addition, over a thousand Compliance Notices were sent out in the final quarter of the year (see chart below). The number of employers approaching the date when they must make their declaration of compliance is now beginning to rise significantly. In future months, the regulator expects to see an increase in the number of times it will need to take enforcement action – due both to sheer numbers and changes to the type of employer who are now reaching their staging date. Our research indicates small and micro employers are more likely to leave things to the last minute.The full bulletin is available hereAutomatic enrolment: Do you know when this will impact your business?All small and micro businesses are to receive letters from The Pensions Regulator in the coming months as part of a new campaign to give them key information on automatic enrolment, including when the duties apply to them. The decision to write to more than 1.5 million addresses across the UK from the end of January aims to ensure that by the summer all employers know their ‘staging date’, which is the date when the law comes into effect for them. Automatic enrolment is not optional: Don’t leave it too late. Figures recently published by The Pensions Regulator show an increase in the number of fines issued to employers who did not comply with their workplace pensions duties on time. With more than 1,300 compliance notices and over 165 fixed penalty notices issued by the end of 2014, more employers are regretting not allowing enough time to prepare for their automatic enrolment duties. There are underlying reasons for the increase in the use of enforcement powers. Firstly, there is an increase in the total number of employers who have staged, and secondly, the behaviour of smaller employers is different. There are more who, despite the messages to prepare early, leave it too late.